Dempsey Dyer timber doors can be manufactured to satisfy the most bespoke requirements - providing you with a comprehensive range of design options. Fabricated using Accoya, European Oak, European Redwood or Sapele timber species, our full range of doors are available in a wide range of translucent or opaque colour finishes. Our timber residential doors are available in a wide choice of styles and are fabricated using laminated timber as standard for increased stability and durability. 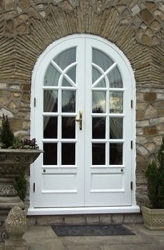 They are also manufactured to PAS 23/24 as standard - achieving Secured By Design accreditation. Dempsey timber French doors feature a design that is both cost effective and practical - providing a simple solution to opening up outside spaces. Featuring a high performance rail system, our timber inline patio doors create openings with minimal impact on internal or external space restrictions.